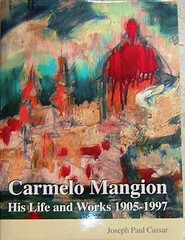 On Thursday 4th December the Book: “Carmelo Mangion: His Life and Works” was awarded first prize at a ceremony “Premju. On Thursday 4th December the Book: “Carmelo Mangion: His Life and Works” was awarded first prize at a ceremony “Premju Nazzjonali Tal-Ktieb 2007″ which took place at the Auberge de Castille, Valletta. The prize was awaded by the Prime Minister of Malta the Hon. Dr Lawrence Gonzi. The author of the book Dr Joseph Paul Cassar was represented at the ceremony by the Carmelo Mangion family members since he is currently engaged in teaching and research in the United States. Dr Cassar is an Associate Professor at the University of Maryland University College. He also lectures at the Osher Foundation Towson University and Carroll Community College, Maryland.